The Tann family from which our links derive were a family of Safe Makers and there is a great website all about them: ‘Edward Tann & Sons – Safe Makers‘ which includes photos of five members of the family from four generation. [Thanks also to the owners of this site for allowing me to use the photos in my tree]. The founder of the company was Edmund Edward Tann, Iron chest maker born in 1747 who married Sarah Sturner on 21st January, 1781 at St. Lukes, Old Church, Finsbury. Their son Edward (b 1781) continued the business with his son John (born 1816) in Hope Street, Hackney under the name “Edw.Tann & Son, Reliance” and in turn with his son John born 18141. However, another of Edward’s sons, George Tann (b 1813) set up a Safe business in competition, in the same street under the name “George Tann, fireproof room & safemaker” with his wife Amelia. Amelia then took over after George’s death around 1849. Meanwhile, Edward’s middle son James Tann (b 1814) was a law stationer like his brothers-in-law Thomas Gravatt and Robert Gravatt who married his sisters Eleanor (b 1818) and Clarissa Tann (born 1819) in 1839 and 1841 respectively. James married their sister Hannah Gravatt in 1836!! James Tann and Thomas Gravatt had completed their apprenticeships together and then set up a business at 17 Serle’s Place, Lincolns Inn. In the next generation, George’s son Robert Tann (born 1843) married his cousin Ellen Ann Gravatt, daughter of the aforementioned Thomas and Eleanor in 1871. Robert took over the Safe business in about 1879 from his mother, Amelia, trading as “R.Tann, Defiance Safe & Lock Works Hackney”. Meanwhile George’s eldest son George Warwicker Tann (born 1834) had a daughter Alexandria Elizabeth Tann (born 1864) who married her cousin once removed John Gravatt, railway clerk, whose parents were also Thomas Gravatt and Eleanor, in 1887. Please the Tann Family Tree for clarity!! 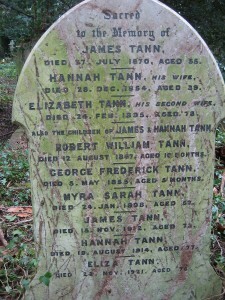 I am also grateful to Peter Tann, a descendant of Edward Tann b 1781, for the photo of the headstone on the right. 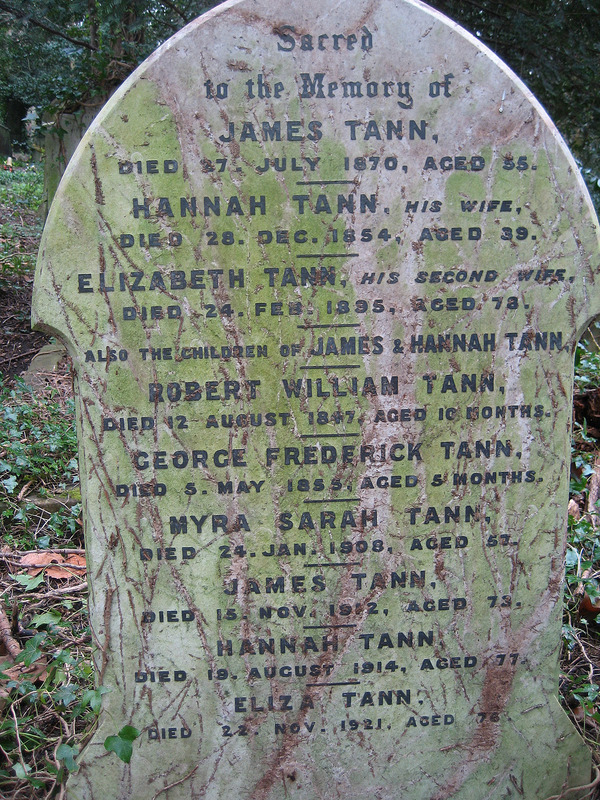 It sees that James Tann, law stationer, his wife Hannah Gravatt, some of their children and James’ second wife were all buried at Highgate cemetery between 1847 and 1921. I think you’ve described the complex and confusing relationship between The Tanns and the Gravatts really well. I’m particularly interested in Robert Tann and his mother Amelia because I have an early iron safe made when either Amelia was still in charge of the company or maybe just after it had just passed into the hands of her son Robert in the 1870’s. I thought you might be interested to know I have in my possession a prayer book belonging to Edward Tann’s family. It lists the date of births of his children on the inside cover. 200 years later it has ended up in California. Fun for me to know a little about the people it belonged to. Thanks. I thought you might be interested in an R. Tann’s Charcoal iron with the stamp london fields london on it. I would! So sorry, I seem to have missed your message completely! I honestly do not know how I messed this – it was last March!